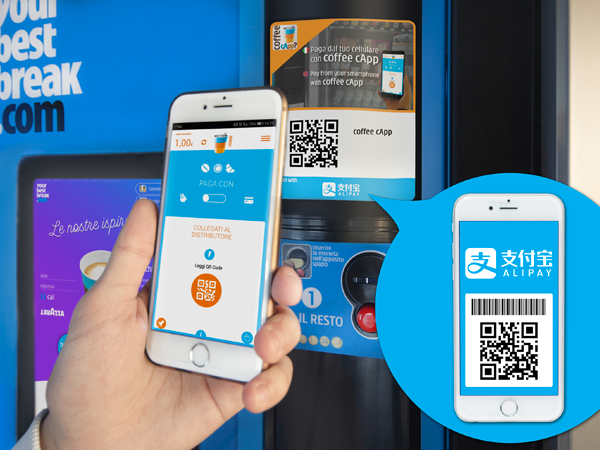 Thanks to the agreement between Alipay, the Chinese online payment platform now active in over 40 countries, and IVS Group, the Italian leader in automatic catering, Chinese tourists will be able to use the Alipay mobile app on IVS Group vending machines in major airports, stations and subway stops in Italy. The two companies will also collaborate in mobile marketing initiatives on the Alipay app to promote the use of products distributed by IVS Group vending machines among Chinese tourists. This partnership represents an important sign of innovation for both companies. Alipay indeed has launched in China a strategy supporting small and medium-sized enterpresises, in which the automation of sales systems plays a critical role. Likewise, IVS Group has invested in ‘Industry 4.0’ projects, which through coffee cApp and connection and monitoring in one network of their vending machines have made possible new services such as electronic micro-payments on several kinds of devices installed in Italy.